by Eugen Rosenstock-Huessy. 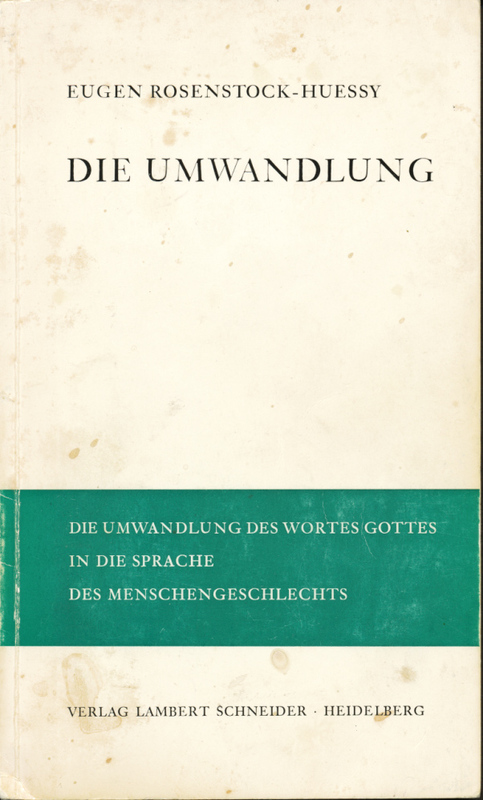 Verlag Lambert Schneider, 1968. Rosenstock-Huessy approved the publication of his essay “The Fruit of Our Lips” twice in his lifetime: first, as the capstone of his two-volume retrospective of his works on language, Die Sprache des Menschengeschlechts, and in this troika of essays. The first two essays have never appeared in English, though the first, “Im Kreuz der Wirklichkeit” (“In the Cross of Reality”), is the last chapter of the two-volume Soziologie (1958). The second, “ICHTHYS: Leben, Lehre, Wirken,” (ICHTHYS: Life, Teaching, and Action”) was originally written as a polemic against the stand Franz Rosenzweig took at the end of The Star of Redemption; the version published four years later as part of Das Alter der Kirche (The Age of the Church) is neither polemic nor addressed to Rosenzweig. In the essay he not only makes the clearest statement of his understanding of Christ, but argues that the true nature of incarnation is the result of a modern (and entirely new) imitatio Christi, one that is primarily political in nature. A new English-language edition of this book is in progress.